The National Agriculture and Trade Show Committee of the Ministry of Natural Resources and Agriculture are pleased to announce the dates for the National Agriculture and Trade Show 2014. The dates will be from May 2nd- 4th at the National Agriculture and Trade Show Grounds in Belmopan. The Planning Committee will be publishing information on booth availability by the end of January. For further information please contact Ms. Delia Cunil at phone number 822-2241 (ext 121) or email [email protected] . The National Agriculture and Trade Show is only a month away, and they've been upgrading the facilities in preparation for the event. Agric starts on May 2nd, and finishes on May 4th. We are pleased to inform that at least five new buildings will be constructed before this year's show. Two food courts, two display pavilions and a new entertainment stage. Follow us as we build these for your use and enjoyment! 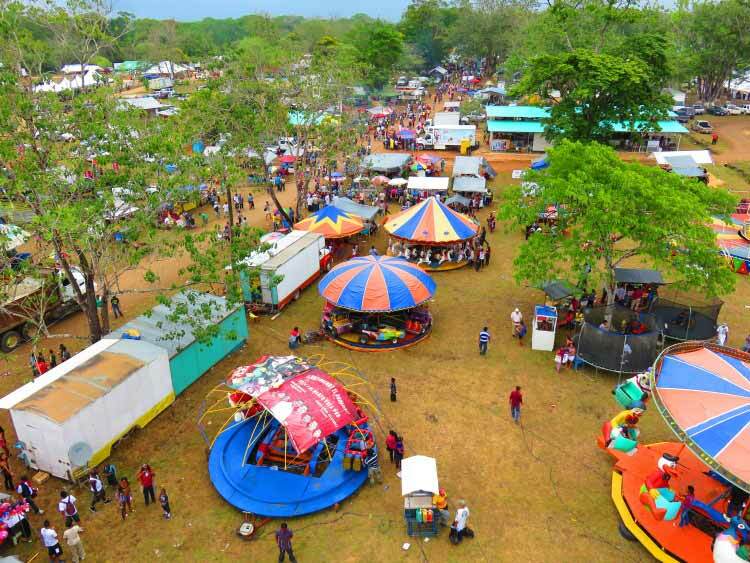 All roads will be leading to Belmopan this coming weekend, with the beginning of the National Agriculture and Trade Show at the show grounds, located by the Guanacaste Park and at the entrance of Roaring Creek Village. The National Agriculture and Trade Show NATS Committee of the Ministry of Natural Resources and Agriculture has announced that the dates will be from May 2nd to the 4th, where thousands of Belizeans are expected to attend from all over the country. The NATS will be inaugurated at 4:00 pm on Friday, May 2. The guest speaker will be Alvin Henderson, from the shrimp industry. The main address will be delivered this Friday, also at the show grounds, by the Hon. Gaspar Vega, Deputy Prime Minister and Minister of Natural Resources and Agriculture. The Show gets underway at 6:00 am on May 3rd. The cost for getting into the show grounds is $2.00 for children and $5.00 for adults. 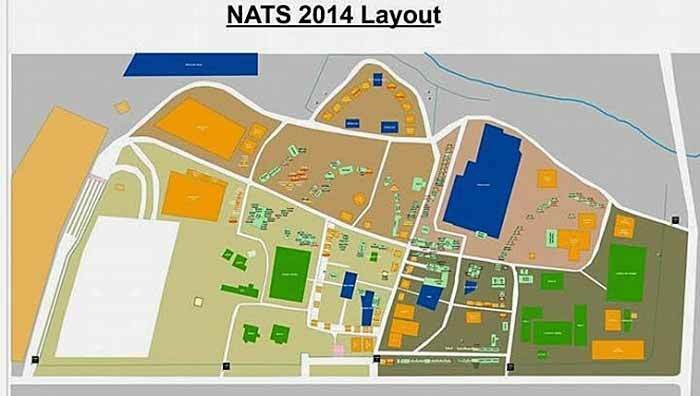 For this year NATS will have a new arrangement for the better flow of visitors. Organizers have zoned the grounds where there will now be seven bars in the bars arena; set up exclusively to sell liquor. New food courts have been set up at the NATS grounds and new pavilions as well for small businesses to showcase their products. One of the main features of the NATS every year is the rodeo and livestock show and it will be held on both Saturday and Sunday. Other attractions of NATS will be the mechanical rides, dog show as well as crop displays. Both BTL and SMART will be having their own operations to sell internet and cell phones at highly competitive prices. “We think that the growth of the agriculture sector has to be public-private sector led and we want [to] work closely with the private sector to be able to move and grow agriculture to what it should be,” says Roberto Harrison, Chief Agricultural Officer in the Ministry of Agriculture and Chairman of the NATS Committee. “We want to invite the general public, we want to ensure and assure the general public that the perspective of the show has changed, we want to assure our visitors that there’s a lot to enjoy, an added security to the grounds...” he also said. Established in 1970, NATS has grown and gained momentum, where many Belizeans come to be acquainted with the most recent developments in Agriculture and its many related activities and products. It is also an opportunity to meet and greet friends from all over, who sometimes travel from great distances to share experiences and enjoy the many harvests from agricultural productivity in the Nation. The official opening ceremony for the Agriculture and Trade Show 2014 kicked off at the show grounds at 3:55 pm and after the inspection of the Guard of Honour by the Governor General Sir Colville Young, the National Anthem was sung accompanied by the Panerrifix Steel Band. The event proceeded with the Invocation which was followed by the Welcome Address by our very one Simeon Lopez, Mayor of Belmopan. “Every year at this time, the city of Belmopan becomes a beehive of activity as the National Agriculture and Trade Show kicks off. Over this weekend, we can expect literally thousands of people traversing the city on these grounds. The display booths have all been neatly set up to afford easier access to the people who go around these grounds. The National Agriculture and Trade Show committee needs to be commended for setting up an even more orderly facility this year. As the years go on, it will be even more orderly until eventually it becomes a showpiece of our nation”. “We secure high quality products destined for a well defined niche market. This is how Belize Shrimp Industry is able to compete in the same market space with countries like Ecuador which has almost 395,000 acres on the production, compared to Belize’s 3, 000 acres of production. We need more of what I refer to as Centers of Innovation within the private sector. It is one of the key components that would allow us to aggressively expand our export base with new agricultural offerings. A Center of Innovation within our industry would be a large investor with deep pockets that is able to bring production and processing technologies to the table. As long as their investments are sociably responsible and environmentally sustainable, we should not fear these large operations, no matter if the capital base is local or the results are foreign direct investments”. 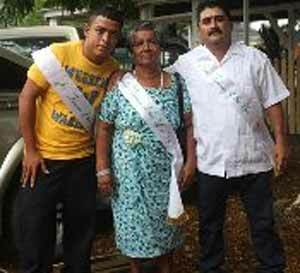 The event moved on with the Sashing of the three farmers of the Year which were won by Deiny Jones, Junior farmer of Cayo District, Angelica Dubon, Women Farmer, of Toledo District and Felix Esquivel, Senior Farer of Corozal District. The National Agriculture and Trade Show grounds opens up to the public tomorrow from 7:00 am to midnight and on Sunday from 7:00 am to 6:00 pm. Plus TV will be bringing you live coverage of the Rodeo Competition and the rest of the day’s activities. The Farmers of the Year received a plethora of prizes in a ceremony at the National Agriculture and Trade show this morning. At the opening ceremony on Friday evening Minister of State for Agriculture Hugo Patt sashed the three farmers: senior farmer Felix Esquivel of the Corozal district, woman farmer Angelica Dubon, and junior farmer Dieni Jones of the Cayo district. Prosser Fertilizer gave each farmer $500, IICA gave each $150, OIRSA gave each $300; while others followed a formula of $500 for Senior, $300 for Female and $200 for Junior. These included the La Inmaculada Credit Union, Social Security Board, Citrus Products of Belize, Belize Sugar Cane Farmers Association and Westrac. Caribbean Chicken also gave each winning farmer 50 pounds of chicken and other businesses sponsored gift certificates. Felix Esquivel, a father of four sons and two daughters, has been farming over 24 years. He had won Junior farmer of the year in 1990. Today at 45, he works a 130-acre farm near Consejo Village, Corozal.. He has 60 head of cattle grazing 30 acres of pasture, and has recently diversified into poultry production. He also produces honey and pollen, and is a major producer. His life-long dedication to farming has provided his family a secure income and helped him to educate his children, two of whom are now in 6th form. Angelica Dubon works a 70-acre farm in Yemeri Grove, 10 miles from Punta Gorda Town in the Toledo district. At 66 years of age, she has been farming since 1969, and had won Woman Farmer of the year in 1997. She has 61 head of cattle grazing 60 acres of improved pasture and also raises pigs and chickens for sale. She has one dairy cow from which she draws milk to make local white cheese and cream for sale at her roadside shop where she sells all her produce. She also has seven acres of fruit orchards which she has planted in oranges, papaya, mangoes, star apples, and an assortment of tropical grits. She also assorted vegetables planted out. She has integrated the latest innovative technologies into her farm, which she has worked full time since 1995. Dieny Jones, 20 has been helping his father work their family farm for the past six years. He works a 60 acre farm on which he manages the production of vegetables: carrots, onions, potatoes, tomatoes, cabbage and sweet peppers, to name but a few. He also has acres planted in corn, beans and fruit. Another great article from SanPedroScoop! With TONS of awesome photos!!! Belize’s premiere agricultural trade show, the National Agriculture and Trade Show was launched on Friday of last week at the Show Grounds in Belmopan. Present for the launching were members of the Diplomatic Corp, Government Officials and many others who share a stakehold in Agriculture and Development. As part of the ceremonies on Friday, the Governor General Sir Colville Young did an Inspection of the Guard of Honor. This was followed by a welcome address by the Mayor of Belmopan His Worship Mr. Simeon Lopez. Mayor Lopez, took the opportunity to thank Show Ground organizers for the use of the ground facilities for market days on Tuesdays and Fridays, while a more centrally located Belmopan market is being completed within the next few months. Mr. Alvin Henderson also proclaimed that more than ever CARICOM needs Belize, despite the fact that Belize’s export trade with CARICOM has more than doubled over the last three years from a value of 34.6 million Belize dollars in 2010 to 86.6 million Belize dollars in 2013. While Belize is blessed with a lot of land, Alvin Henderson contends that what is needed now is to make a resolve to make export development a priority. “Importing and consuming more that we produce is an unsustainable economic model for a small developing country like ours,” he said. An example of this is in the sugar industry where over the last three crops, farmers have produced high quality cane, while increasing output, this trend must continue as the European Union has already announced further market liberalization for 2017. “Reform is never easy, it is never an easy undertaking and it will continue to be challenging, but let me reiterate this Government’s full commitment to sustained reform of traditional industries and certainly a deep commitment to all small farmers throughout this country,” assured Jose Alpuche. All three prominent farmers for this year were then sashed by both the Queen of Belmopan Makaela Banner and Ms. Sharon Ramclan, C.E.O. in the Ministry of Natural Resources. Decorated on stage were Mr. Dieny Jones 20 year old Junior Farmer of the Year from La Gracia Village, Mr. Felix Esquivel 45 year old Senior Farmer from Corozal Town and Mrs. Angelica Ursula Dubon 66 year old Woman Farmer of the Year from Yemeri Groove. Senior Farmer of the Year, Felix Esquivel, told the Guardian that he makes most of his money from selling onions; although 2 years ago he had problems selling this crop. He maintains 100 local chickens and wants to get into the organic growing of chickens. Woman Farmer of the Year Mrs. Angelica Ursula Dubon also told us that she now has in stock a selection of cattle that have been primed to be resistant to many diseases. Her farm now comprises of 60 acres of improved pasture, 51 heads of cattle, pigs, horses and chickens. She also maintains seven acres of assorted fruit trees, one acre of corn and a quarter acre of assorted vegetables. After the official ceremonies concluded on Friday at the opening of the National Agriculture and Trade Show, with entertainment by the Panerrifix Steel Band, the show was then opened for both Saturday and Sunday and despite an overcast sky, many Belizeans did come out to enjoy the new amenities, produce and entertainment offered at the fair. The theme for this year is “Stimulating Prosperity in Agriculture and Food Production through Renewed Public Private Partnerships,” as was much evident during May 2-4, 2014, which brought both sectors together for the benefit of Belizeans from around the Country. Also, announced last Friday was an opportunity to win one million dollars in the Belmopan Rotary Club’s ‘The Belize Duck Race.’ This is an irresistible opportunity, for from now to November 29th of this year, attempts will be made for Belizeans to adopt 30,000 ducks at $10.00 per ticket to raise funds for community development projects. On the much awaited date of November 29th, these ducks will be launched from the Hawkesworth Bridge into the Macal River. The first duck that arrives at the lower lying wooden bridge, located downstream in a rapid area, has a guaranteed $10,000.00 prize. However; for every 3000 pliable ducks, there will be one duck that will be marked. The first marked duck to cross the temporary wooden bridge will give its owner one million Belize dollars, which comes courtesy of the Belize Natural Energy.